A key feature of Smart Displays such as the Google Home Hub is that they can be used to help you prepare dinner by presenting hands-free, step-by-step recipes for you to follow. This is open to developers if they want to add their own actions, just like BuzzFeed’s Tasty did recently. Now, Innit is getting in on the act. All you have to do is say “Hey Google, talk to Innit” and it will bring up a customized interface offering a variety of kitchen assistance. You’ll be able to get personalized recipe recommendations with video walkthroughs and Innit is even partnering with connected appliance companies to enable automated cooking functions. If you download the Innit Android app, you’ll get access to even more useful features, such as meal planning, personalized nutrition, and smart shopping lists. This type of Smart Display integration isn’t that widespread yet, but the potential is huge — so much so that Innit has won a CES 2019 Innovation Award for its good work. The Innit action should be live on your Smart Display right now if you’re in the US, but it doesn’t work yet in the UK. More integrations like this could be on their way, including from the likes of SideChef. Chris Cosentino did a Google Assistant Playground demonstration at CES, so we can expect his platform to bolster the Assistant’s cooking credentials in the near future. LAS VEGAS–(BUSINESS WIRE)–CES 2019 – FoodTech Live — Innit has built a new Action for the Google Home Hub and Smart Displays with the Google Assistant to bolster consumers in the Smart Kitchen. 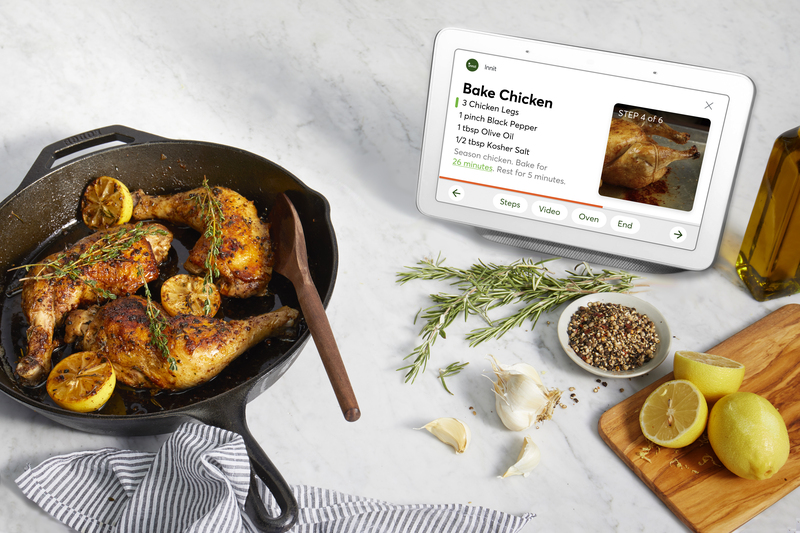 Innit worked with the Google Assistant team to provide consumers with unprecedented confidence and assistance in the kitchen, including personalized meal recommendations, hands-free step-by-step video guidance, and orchestration of cooking programs on connected appliances. The Innit Action on Google is available immediately – just say “Hey Google, talk to Innit” to get started. Innit has also been named a 2019 CES Innovation Award honoree in the Software and Mobile Apps category. Innit has built a new Action for the Google Home Hub and Smart Displays with the Google Assistant to bolster consumers in the Smart Kitchen. Innit is the first open smart kitchen platform to enable deeply personalized food recommendations, coupled with automated precision cooking, enabling incredible everyday cooking results with a single touch or voice command. Innit has built a broad partner ecosystem including four of the top six appliance companies and three of the top four food companies, and the joint solution connects them into a rich hands-free consumer experience on Google Smart Displays. Consumers don’t need any smart appliances to get started — they can simply “talk to Innit” on their Smart Display with the Google Assistant to get step-by-step guidance for everyday cooking. Innit leverages the Assistant and acts as a “culinary GPS” system, calculating steps for each meal and helping home chefs create amazing results while minimizing preparation time. Downloading the Innit mobile app enables additional advanced features, including personalized nutrition, customized meal planning, smart shopping lists, and integration with multiple brands of non-connected and connected kitchen appliances.